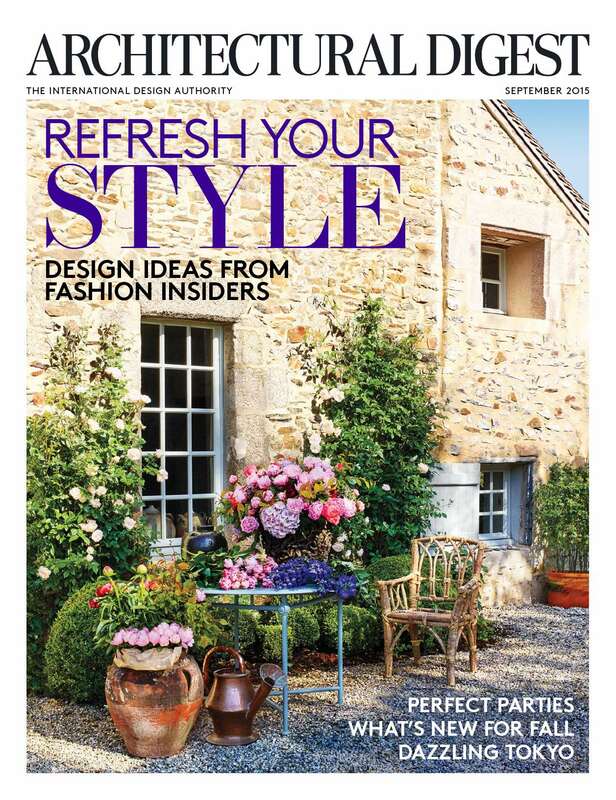 Architectural Digest has debuted their September issue and it’s pages are full of fashion insiders debuting their chic homes and vacation getaways. On the cover? Oscar de la Renta’s creative director Peter Copping‘s picturesque Normandy château, which he owns with his husband, floral designer Rambert Rigaud, who is a native of Versailles and the former studio director for Christian Dior Haute Couture. Although Copping and Rigaud now reside in New York City, the two were unable to give up their French retreat. “We are both very passionate about houses and gardens,” British-born Copping told Architectural Digest. The rest of the issue features Derek Lam‘s light-filled Gramercy Park residence, Naeem Khan and his wife Ranjana‘s art-filled Miami triplex, GQ design director Fred Woodward and his wife Janice‘s midcentury-modern glass masterpiece outside of New York City, and Barneys CEO Mark Lee and KCD president Ed Filipowski‘s scenic Bedford, New York retreat. The latter have been featured in the pages of Architectural Digest before for their ultra chic prewar Manhattan penthouse. But, in our humble opinion, Christian Dior’s power publicist Mathilde Favier-Meyer‘s Paris duplex is the most stellar of all, if only for her closet that houses 400 pairs of shoes and is probably the size of our own Manhattan apartments. And yes, the interior design is pretty spectacular too. Plus, pick up a copy to find out more about Rem Koolhaas‘ vision for Fondazione Prada in Milan, the Garage Museum in Moscow, and Stefan Beckman‘s visually arresting fashion-show set design.